Welcome back to this bad romance series of Approve Leave Request from ESS/MSS and Fiori UX. In Part 1 and Part 2. We have established a case and a workflow to run synchronously from both sides. In this part I will explain you the technical part of the workflow we have just discussed. So get set go! To cater the customized changes in the workflow, I have created a customized class with few methods to get my logic working. This is my customized class with a few methods, lets go hold of these quickly. lr_request ?= ca_pt_req_header=>agent->if_os_ca_persistency~get_persistent_by_oid( lv_oid ). Code is self-explanatory, ask me in comments if you don’t get anything. I am NOT going to explain FM: ZWF_GET_ALL_APPROVERS_LEAVE because I have my own logic to fetch next approver. You may use your own. 2. Activity: Getting Employee Name is easy. Go, get it from PA0002, pass PERNR. 3. Activity: Approval Process is a standard task TS12300097 SAP use to approve leave request. 5. In case of APPROVED: Activity: Get Next Approver (Method: SET_NEXT_APPROVER in my class). Code is well documented, please go through. Import: Request ID, Current Agent) Exporting: Next Approver. Same binding is done from Method to Task and from Task to WF. WITH KEY sys_user = lv_n_agent. Rest is standard. Email and SMS logic is all over internet. Find and send them. Now we are done with the Workflow development and explanation. Technical part is done as well, if you have any question, please feel free to comment. Since, we are done with the workflow. Pretty easy yeah? But where is the challenge. Go to Step number 6: Change Status to SEND. Somehow SAP don’t change this status and throws and dump. This dump comes whenever the Approve button is pressed either from Fiori or ESS/MSS. Why this dump occurs? Let’s catch that! I have analyzed this thing and I have concrete answer to this (this is the pain area for most of us). Just putting in a screenshot just to be sure. Above dump says that there an expectation when inserting in some table? Which table? Let’s analyze. Dump occurred in this method: MAP_SAVE_TO_DATABASE line: 152. This dump occurred when I tried to change the Status from APPROVE to SENT in my custom (CHANGE_STATUS_SENT) method. Loop found the current status of request as SENT, loop condition met. Leave Request again sent to the same approver again! How irritating for the user who has just approved the leave request and came back to him! Wow! Great! Amazing! Imagine this happening with 1800 users! Why this dump came? Because by default sometimes I don’t know how. SAP put an entry of status SENT when leave is approved (specially in case of multi-level). That SENT row is already there in table PTREQ_HEADER and I am trying to insert the same row. So, it says I have that row already which you are trying to insert and dumps! Let me show you the table. You see above? All rows are set to SENT. Why? Because of that nasty dump! You could have noticed that I have put a WAIT statement in my methods, yeah because let SAP do its entries in the said table then I will do my trick. So, let SAP put a SENT status in the table after the request is approved. Then I am creating a new row with status APPROVED then SENT again. This is an easy catch. If any document goes in to error (remember, not talking about workflow). That’s all folks! I hope you have enjoyed this series and learned a lot. Please let me know if you have any queries. thank you very much for that technical deep dive in that 3 parts. What is a little unclear for me is the following: Why didn’t you use the BAdI PT_ABS_REQ with method get_multiple_approvers in combination with the standard workflow WS33700137? Actually, the method get multiple approvers works when we are dealing with the standard WF, in this case if you notice we have used the custom one, plus we are fetching apporvers according to client’s needs. Not from Org structure. Thanks for the blog, i had one doubt in you are setting same status i.e c_reqtrans_approveis that right because we need to set it as sent so can you please guide ? I have mentioned this issue and resolution in this blog series. Please follow all parts. I have copied the workflow for leave request WS33700137 and customized for multilevel approver. All the process of multilevel approval and rejections works fine, but in the back end when try to change the 2nd level to third level approval, i get the below dump. how to handle it. Exception ‘CX_OS_DB_INSERT’ was raised, but it was not caught anywhere along the call hierarchy. 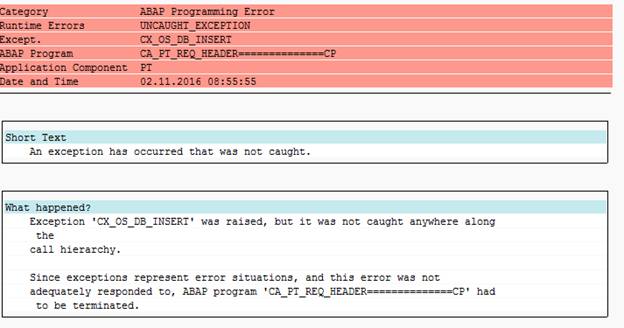 Since exceptions represent error situations, and this error was not adequately responded to, ABAP program ‘CB_PT_REQ_NOTICE==============CP’ had to be terminated. SORT lt_ptreq_header BY version_no DESCENDING. READ TABLE lt_ptreq_header INTO ls_ptreq_header INDEX 1. IF lvv_status IS NOT INITIAL. ex_error = ‘HEADER APPROVED STATUS’. ex_error = ‘Not Sent status’. ex_error = ‘NOT AS APPROVED’. How to over come this dump….even i kept 30 seconds wait also before the sent status. Yes your blog is very conclusive. In our scenario, for 2 level leave request , followed same logic but using BO instead of class. Issue is with FIORI when First level request approve/reject leave request item is not disappeared (cleared). After 2 level approver approve/reject the request item get cleared from the list. but client requirement is that after 1 level action it should get cleared from that first approver item list. it is working fine in ESS Portal.